My experience with the DVB-T dongle has been somewhat mixed. It does receive all the signals that I’m interested in, including fairly weak satellites. However, interference often blocks reception. Most of the time the signals are blocked for short amounts of time, around a second. The blocking signals are not visible on the waterfall display, which I think means that they are not close in frequency to the signal I’m receiving. This is not surprising, given that the bandpass filtering of the dongle is not particularly good and given that the 8-bit analog-to-digital conversion has a very limited dynamic range. The best way to resolve this is to add a preamplifier between the antenna and the dongle. Most premaplifiers have bandpass filtering at their input, and some also have filtering at their output. A preamplifier also allows you to add a sharp bandpass filter at its output without reducing signal strength or adding significant noise. I tried my old 145MHz preamplifier and it seemed to improve things a bit, but it’s huge. I decided to build a smaller preamplifier for UHF (430-440Mhz) and to add a sharp filter at its output, most likely an interdigital filter. 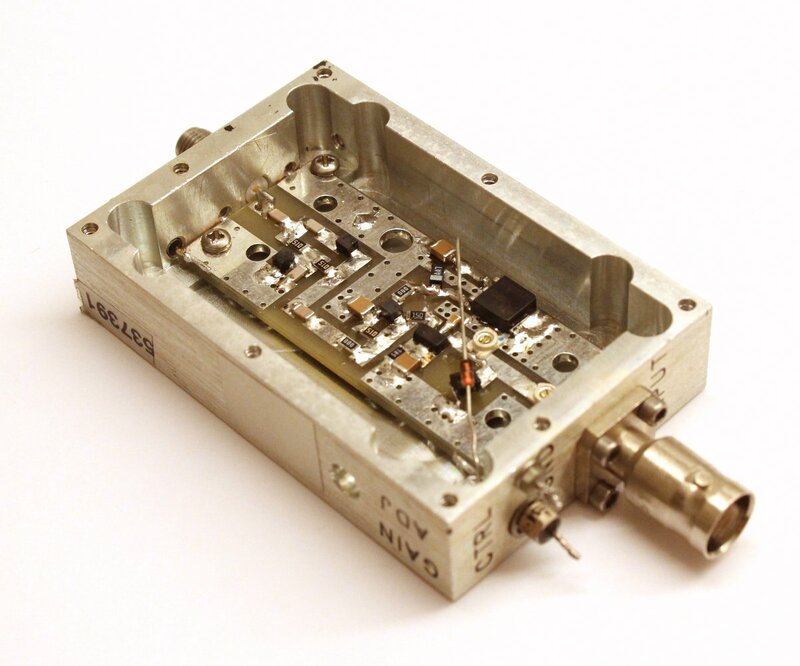 There are several good preamplifier kits available for UHF. The cheapest is made by Ramsey. It’s filtering is not very good, it uses leaded components (not ideal at UHF), and the transistor has a relatively high noise figure (they advertise it at 1dB, but the data sheet of the transistor they use, 2SC2498, specifies 2.5dB). Minikits’s preamp also uses mostly leaded components, but it has a better input filter and its 1.5dB noise figure is believable. Other kits use surface-mount devices. A kit by David Bowman has a noise figure of only 0.5dB but not much filtering (only high-pass). Gyula Nagy designed a preamp with an even lower noise figure and with sharp bandpass filtering, but he only sells the 144MHz version of it (and he only sells it with an enclosure and connectors, which makes it more expensive than other preamp kits). I eventually decided to buy a preamp kit from Down East Microwave (DEMI). It has a low noise figure (better than 0.5dB if tuned for low noise and only 0.2dB higher if tuned for maximum gain), and filtering on both the input and output. The filtering is not very sharp (the preamp is designed to be followed by a separate bandpass filter), but there is filtering. 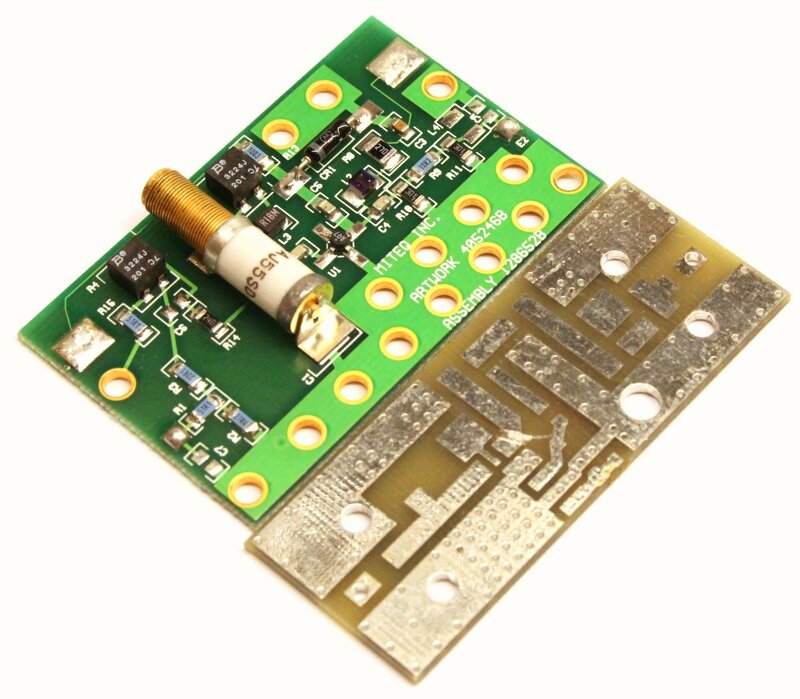 It comes in various forms, including a PCB+components kits without an enclosure and without connectors. This form is relatively inexpensive at $25 plus shipping (for comparison, built in an enclosure with connectors, the preamp costs $75). The output filter is a diplexer, which improves stability when the preamp is followed by a sharp filter (it sends out-of-band signals to a dummy load rather than to the filter, which prevents them from being returned to the amplifier and possibly causing instability). 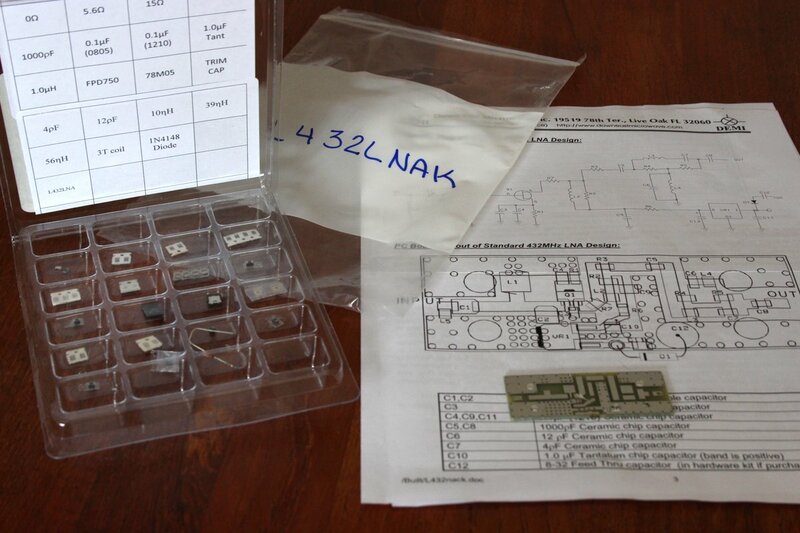 The kit contains a PCB, instructions, and a plastic tray with the components, almost all of which are surface-mount devices. The tray has 24 compartments for components, and a legend tells you which parts are stored in each compartment. This is essential, since many of the components have no markings at all (resistors do have markings, but capacitors and inductors do not). Surface mount components come in tapes, and the tapes are actually glued to the compartments; this helps keep the components inside the compartments until you actually need them. The glue’s bonding is weak so it’s easy to separate the tapes when you need to. Before I started building, I needed to decide on an enclosure. 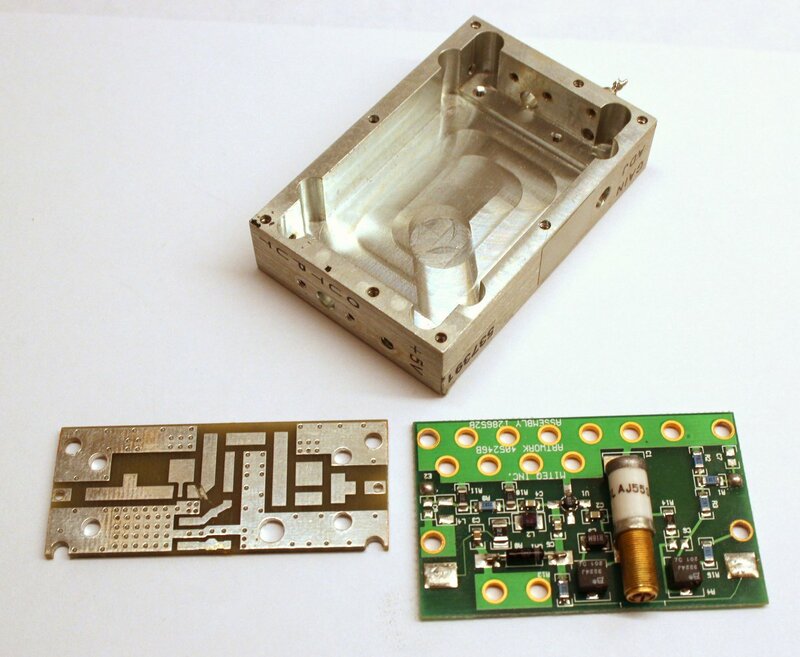 I initially intended to create an enclosure from blank PCB material. But when the kit arrived, I realized that the PCB would almost fit inside the enclosure of a surplus 140MHz amplifier I have. I bought a few of them a while ago just for the enclosure and connectors. On the right you can see the enclosure (opened) and the amplifier that it contained, but with the connectors already removed. The connectors were BNC at the input and SMA at the output,and there are feedthrough capacitors for power (and for a control function that is not needed with the DEMI premap). 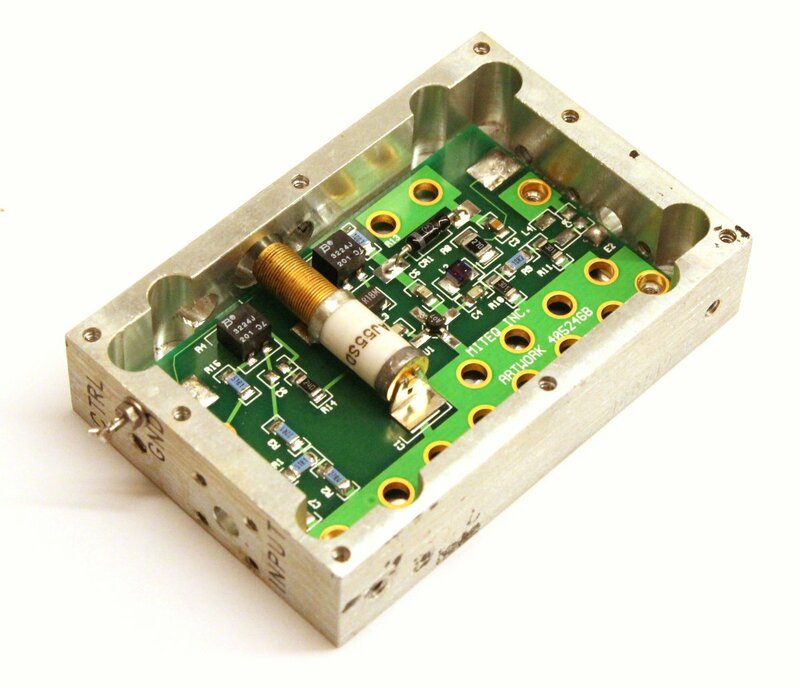 The DEMI preamp board was narrower than the 140MHz amplifier but about 2mm longer, so it did not fit in the enclosure. Fortunately, the 2mm at the edges did not contain any signals, just a bit of the ground plane and the input/output connections. I filed away about 1mm from each side until the board fit inside the enclosure. The input/output connections on the board are plated-through holes, so I had to remove some of the plating on the ground-plane side, so avoid shorting these connections to the enclosure. Finally, I drilled mounting holes using the original 140MHz amplifier as a template; they went just through the ground planes, not through signals on the PCB. You can see the result below. At this point, I was ready to solder the components. I knew I had to be very careful and not let any parts get lost or separated from its label for too long. I was as careful as I could, but I still managed to lose a 1μF tantalum capacitor. It’s actually one of the larger components, but it somehow jumped on my shirt and disappeared forever. I did search for it all over the place, but it was somehow gone. I didn’t have a replacement. It should have been on the output of a 78M05 regulator, so I checked the data sheet of the regulator and didn’t find any constraints on the capacitors that can be used, so I just replaced it with a 10μF 10v capacitor that was small enough to fit on the PCB. Afterwards I was even more careful afterwards (and didn’t lose any more components). When I was done with the soldering, I screwed the amplifier into the enclosure, soldered the connectors, and started testing according to the instructions. 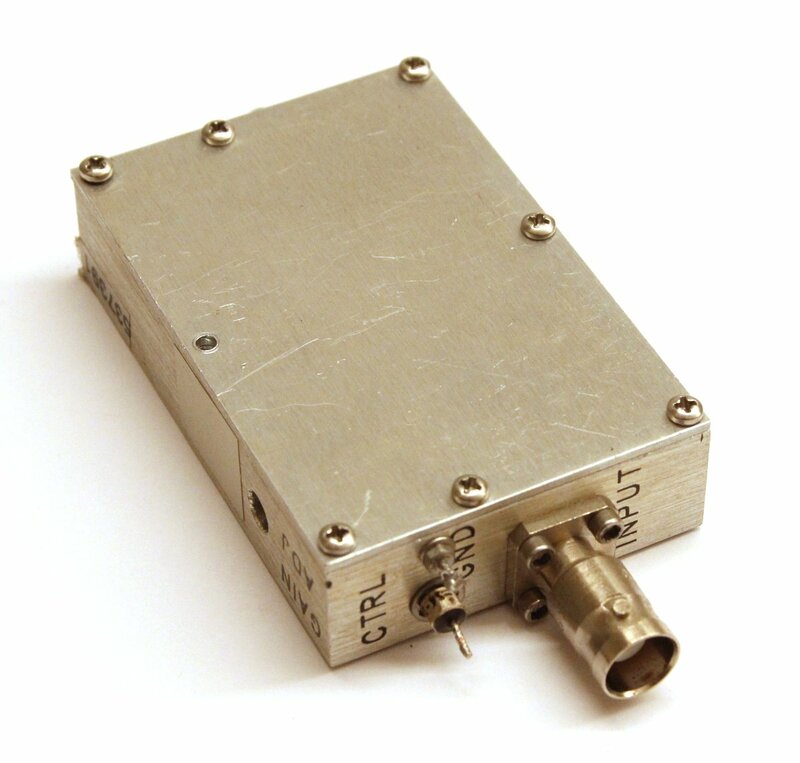 You perform the initial tests with 50Ω dummy loads on the input and output. This went fine and the amplifier consumed an amount of current that the instruction says is reasonable and does not indicate oscillations, around 85mA. I then tuned it roughly with a receiver. At that point it was supposed to work with or without an antenna and load, but it did not work without an output connection (current consumption dropped to zero). I could not figure out why. I decided to tune it more carefully at a lab. I did that at the Herzliya Science Center, with a calibrated signal generator and a spectrum analyzer. I was able to tune the amplifier, but it still behaved erratically. After a lot of troubleshooting I realized that I forgot to tighten the screws that hold the PCB to the enclosure. This pressure contact was also the ground return path for the power supply, so as long as the connection was loose, the power supply connections were unreliable. After I tightened the screws and re-tuned the amplifier for maximum gain, it started performing reliably. You can see it in the enclosure on the right. Testing with the dongle show marked improvement in signal quality and a reduction in interference. I was able to receive all the satellites I tried, including some fairly weak ones like CO-55 and CO-57. I would like to test the dongle+preamp receiver in a full-duplex satellite contact, but I didn’t get around to this.